The topic of A2H2’s February event was “Transitioning into Independence for Individuals with Disabilities”. 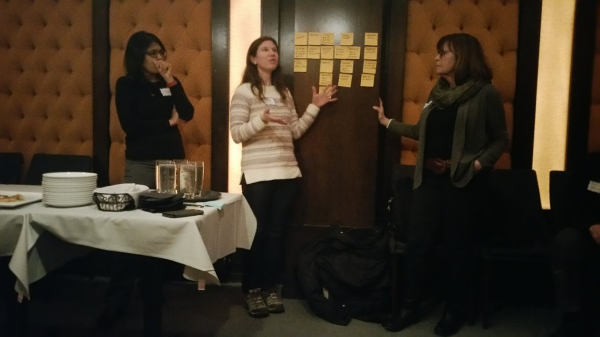 A diverse group of people from fields such as machine learning, software engineering, user experience and public health gathered at Melange to explore this topic and to meet others in the community passionate about healthcare. We began by discussing some of the problems people with emotional, cognitive or physical disabilities face. Even though our backgrounds, ages, and life experiences varied greatly, most of us knew someone who had a disability of some kind – some had grandchildren with learning disorders, others had family members who use wheelchairs, and a few had relatives with significant cognitive damage from physical accidents. 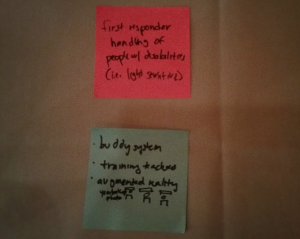 How can we create scalable solutions for technologies geared toward people with disabilities? This group focused on the problem that technology companies do not always keep up with the evolving needs of people with disabilities, and that even when families develop innovative solutions, they often do not have a way of scaling this to become a viable business-driven product. Focusing on a design persona of an autistic child with light sensitivity who cannot play the popular game Candy Crush, the group ultimately landed on the idea of a central repository that collects all accessibility-related issues. This would allow users to voice their concerns, and allow tech companies to obtain much sought-after and difficult to access user research data. How can we help EMTs learn how to work with students with disabilities in a school crisis? How can we make information sharing easier for people with disabilities? This group dived deep into the complexity of health information sharing, and raised important questions about issues like trust, social support, standardization, challenges of creating integrative approaches, as well as what it means to provide patient-centered information. They also pointed out that any solution is hugely influenced by funding, and that ‘follow the money’ is a mantra that is impossible to ignore. By the end of the night, we learned a great deal about the challenges faced by people with disabilities and had started important conversations. We also got to meet innovative people who were contributing to the community in exciting ways, whether by developing a new app for bipolar disorder, leading initiatives to help medical school faculty produce viable business plans for their technologies, or acting as a caretaker for family members who are patients. Diane Bouis, one of A2H2’s founders, described how putting a social worker, a ballerina and an engineer into a room and asking them produce solutions to problems in healthcare means they will come up with surprising results that are vastly different from those produced by a group of medical professionals. In the same spirit, June’s health hackathon will be an opportunity for individuals to bring their strengths and ideas and to help brainstorm innovative solutions to problems in healthcare. The next A2H2 Happy Hour “Patient Centered Design” is on March 21st, and the A2H2 2018 Annual Hackathon will be June 22nd – June 24th.